For a uniform geo-electrical earth the measured surface impedance is related to the true resistivity of the earth. There are several derivations to compute the apparent resistivity ( ). Cagniard (1953) relates the apparent resistivity to the geo-electrical impedance ( ) ( ). Weidelt (1972) worked with response functions where the corresponding definition of apparent resistivity being . For the following case we are using Max Meju's solution, one of the more simpler solutions to follow. Most, if not all, 1D MT formulations are an iterative process. For the benefit of this formulation consider Figure 2. Figure 2 shows the labeling conventions employed. The formulation starts from the basement (i.e., layer n) and iterates through the above layers. 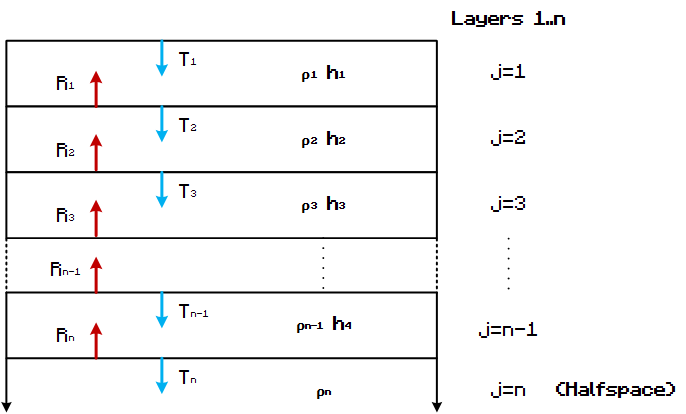 In other words the solution is computed and passed to the above layer (from layer n to layer 1). Figure 2 - This Magnetotelluric forward modeling solution is conducted over a homogeneous 1D layered earth with n layers. Each layer has its own resistivity and thickness. As the naturally occurring electromagnetic waves propagate through each layer they must obey a number of boundary conditions. Each layer boundary can be considered to transmit and reflect waves. is a complex number and can be thought of as the theoretical impedance of the basement. So if there were no above layers, this would be the measured impedance. So to solve the above layers we need to know the energy that is reflected and transmitted at each layer boundary. This is done by computing the reflection coeficient . Prior to computing the reflection coeficient the induction parameter, , exponential factor, and intrinsic impedance must be computed. Let's start this by creating a function called modelMT. The function modelMT will compute the apparent resistivity given a 1D geoelectrical model and MT frequency. The method will take in three arguments, the layer resistivities, thicknesses and a single frequency. The output of the program is an apparent resistivity in Ohm.m and phase in radians. The next step is to pre-compute constants which we will use a number of times in the following computation.This includes the magnetic permeability, angular frequency and number of layers. As we have seen in the formulation, each layer has its own impedance. So to begin we will initialise an array called impedances. within this loop you need to compute equations F3 to F5. These include the induction parameter, exponential factor and intrinsic impedance. Ensure that when you compute the conductivity a float and not an integer is used. So use 1.0/resistivity rather than 1/resistivity. The next step is to calculate the reflection coeficient (F6) and impedance (F7) using the current layer intrinsic impedance and the prior computer layer impedance j+1. Finally you can compute the apparent resistivity F8 and phase F9 and assign them to the output matrix! Import the required libraries cmath and math. The math library contains real number mathematical functions and contains the same functions found in the ANSI c library. The cmath library contains mathematical functions for complex number calculation. Initialize constants, geo-electrical and recording parameters. mu is the Magnetic Permeability (H/m) and is only computed once at the start of the program. 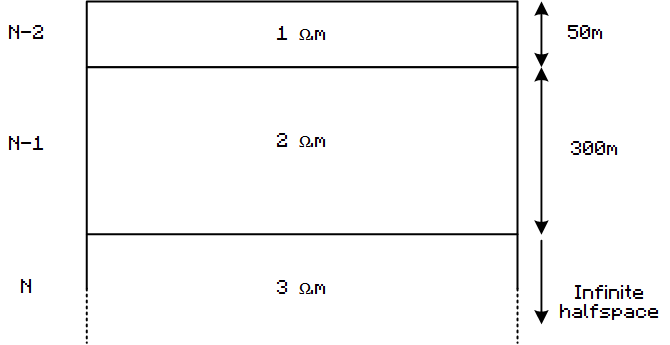 The resistivities array contains each layer resistivity in Ohm.m, starting with the top layer in index 0 (left) and the half-space resistivity in index 3 (right). The thicknesses array contains the thickness in m for each of the layers, starting with the top layer thickness in index 0 and ending with the thickness of the layer above the half-space. This program will accept any number of layers, but you must ensure that if N is the number of resistivities, the thicknesses array must have N-1 elements (See Figure 1 for resulting geo-electrical model). The nlayers variable computes the number of layers (including the halfspace) this is so it does not have to be computed for each iteration. Finally frequencies contains all the frequencies, in Hz, that the apparent resistivity will be calculated for. Note: The program will work with any number of layers and frequencies. Figure 1: A schematic of the resulting geo-electrical model. Using a for loop, iterate over each frequency found in the frequencies array and compute the apparent resistivity. The method requires the angular frequency (w) and the impedance array is reset each iteration for robustness. The first step is to compute the halfspace impedance (see F2) and assign it to the final value of the impedances array corresponding to the halfspace. The basement impedance is computed using the cmath.sqrt operator. Within this loop you need to compute equations F3 to F5. These include the induction parameter, exponential factor and intrinsic impedance. Finally you can compute the apparent resistivity F8 and phase F9 and print the resulting data! Basokur A T 1994 Definitions of apparent resistivity for the presentation of magnetotelluric sounding data; Geophysical Prospecting 42 141–149. Cagniard L 1953 Basic theory of magnetotelluric method of geophysical prospecting; Geophysics 18 605–635. Niwas S, Gupta P K and Gaur V K 2005 Normalized impedance function and the straightforward inversion scheme for magnetotelluric data; J. Earth Syst. Sci. 114 5 523-531. Pederesen J F and Hermance 1986 Least-square inversion of one-dimensional magnetotelluric data: An assessment of procedures employed by Brown University; Surv. Geophys. Weidelt P 1972 The inverse problem of geomagnetic induction; Z. fur. Geophys. 38 257–289.